The info posted was recorded when the first entry for the lodge was set up in the database. The first line contains the lodge number, The parent district or region, and the structure level of the entry (3=local lodge). 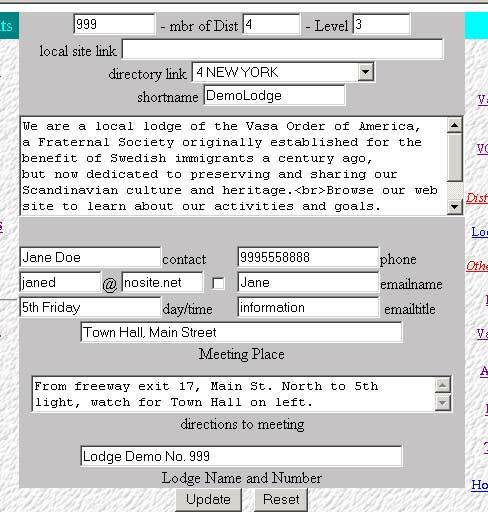 Note that the fictitious lodge "demo # 999" claims to be a member lodge of NY District 4. Lodge Name and Number - this box contains the heading presented on all pages of your site. Local Site link - if your lodge already has a local web site, enter the URL here. as: www.locallodgesite.org (do not include the http:// prefix. The link will be incorporated into the template presentation as a source of more information in a soon to come release. Shortname: This entry will be used as a readable label on the link to your site posted in the right sidebar with any other lodge pages from your district or region. You may change it, but please keep it short and identifiable. unlabeled text box: a description of your lodge (About Us) - the text will be shown in the first panel encountered by a visitor to the site. You may tailor it to suite your lodge, including special activities of your lodge etc. Contact Information: The following entries will help prospective members reach you for information: They will be used in panels now under development. Contact: The name of a member who will serve as a contact for visitors to the site who request information about the lodge, or membership. [ ] (checkbox) - check to indicate willingness to post an email link on the site for visitors to use to contact the lodge. Emailname - The name to be displayed with the email link, such as "John", "Lisa", etc. Emailtitle - The title to be displayed with the email link, such as "Membership", "Information", etc. Directions to meeting: (free form directions to your meeting hall - future releases may include map options). Jane has completed the form, overtyping entries that she wishes to change. The reset button will restore the form to the data currently posted. The update button will post the new information to the database. Please notice the formatting code in the text box.. <br> forces a line break this is a standard HTML programming code. Many but not all such codes are allowed within the text boxes. Once form is complete, click the "update" button. The panel above reflects the changes just posted. Note the new paragraph starting "Browse our web site..." The other changes and additions are not apparent as they will be incorporated in the site at a later time. Since Jane did not check the permission box, her email address will not be linked to the site. 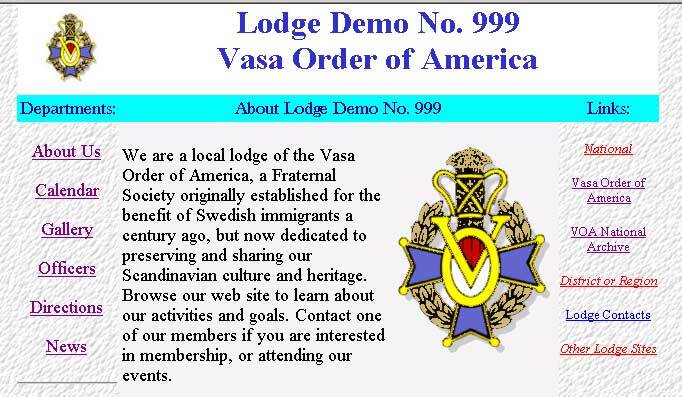 It will however be used to contact her regarding the site or the lodge by the Grand or District Lodge, or webmaster@vasaorder.com.